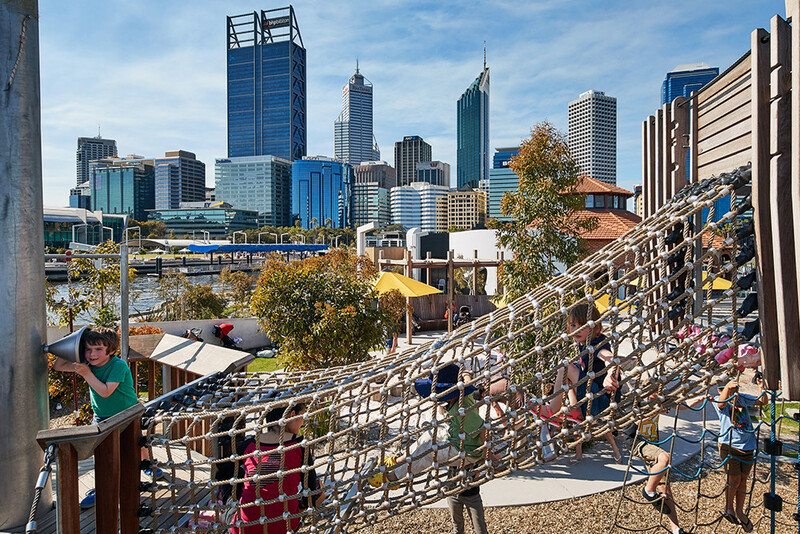 The Elizabeth Quay development in Perth’s CBD is home to a new treasure island with the opening of a playspace that draws on the city’s early maritime history. 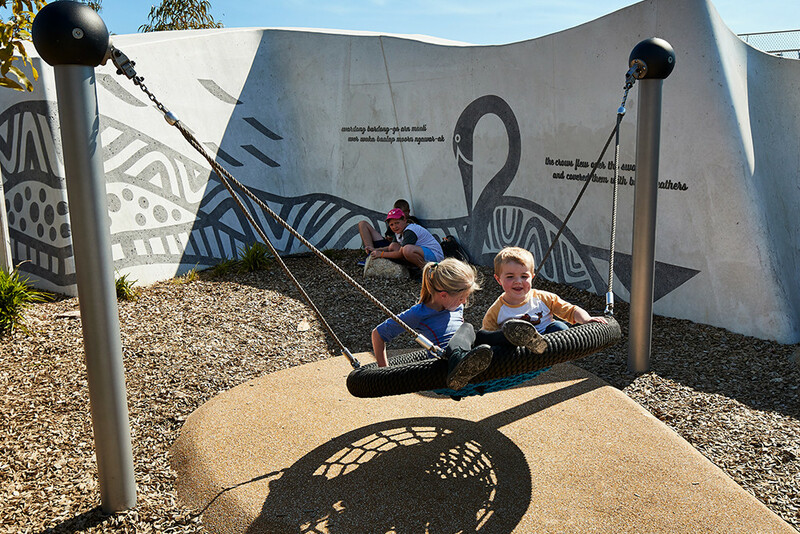 We were commissioned by the Metropolitan Redevelopment Authority and collaborated with Griffin Longley of Nature Play WA and artist Anne Neil to create this bespoke, nature-inspired adventure playspace. Uniquely located on a man-made island within a new parkland precinct, the playspace is adjacent to a moored replica of an historical Duyfken ship. The design makes reference to the vessel and its craftsmanship through materials such as timber and rope, as well as elements such as masts and crows nests. While looking at the early nautical heritage of Perth, we also researched the play items children were using and the games they were playing in the mid 1800s, such as pick-up sticks, string games and treasure hunts, and drew influence from them for the design. The playground serves as an adventure island for children where they can ‘walk the plank’ via log steppers, climb ropes or hunt for hidden treasurers, such as crosses buried in the base of the sandpit. The design also draws on the unique character of the area and includes a mural that tells the Noongar creation story of Western Australia's iconic Black Swans. We believe that any reference to Australian heritage and character should incorporate local materials as much as possible. Almost all of the playspace is constructed from Australian materials and we sought to source the majority from Western Australia. 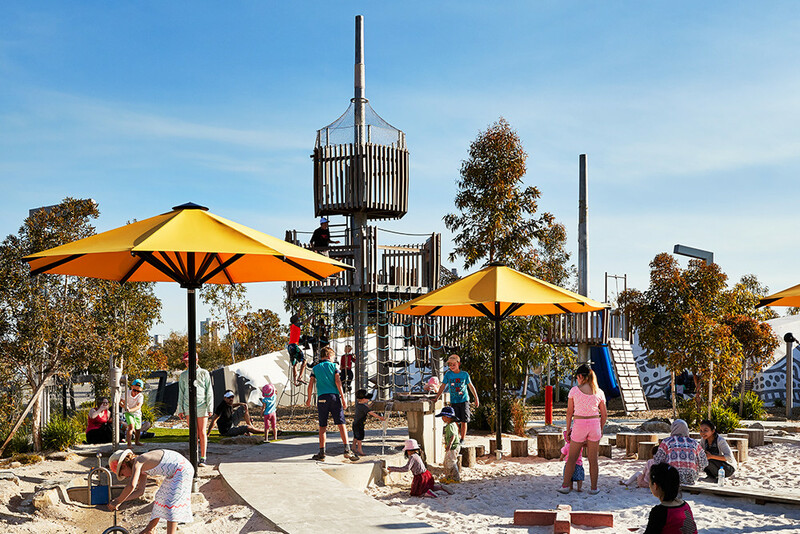 The Elizabeth Quay Playspace provides a diversity of experiences for children, including climbing activities, sandpits and water play, which is an essential element of any adventure island.